Sea Beans! I've found only at farmer's markets although I know there are other places that have occasionally carried them. 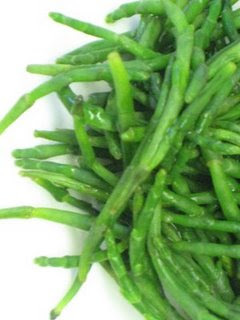 I have so much more to say about these green, crunchy haricot verts of the ocean but I've been swamped this week. All I can say is that if you find these fantastic sea beans or sometimes called drift seeds, pick yourself up a bag! See this great link about sea beans for the information I wanted to give to you but don't have time to fully share. The Ballard Farmer's Market is where I saw them last. Quick Tip on Cooking Them: Blanch in boiling water, stop the cooking in an ice-bath, toss lightly in olive oil and either eat them as is or them make a great salad or Asian soup addition. Awhile back I was writing about a whisky dinner I was asked to pair Johnnie Walker whiskies with. Sounded like a great challenge for me and so, in a couple weeks I am cooking for 12 winners of the auction from Seattle Works. Here is a peek at the menu. Last night I was a guest chef for Seattle Uncorked Wine Club's cooking class series. Founder, Sommelier David LeClaire allowed myself and 12 other students to take over his kitchen to cook 5 dishes from Eat and Drink in the Northwest summer edition paired with wines suggested from the book or similar choices. I had a great time meeting new people excited to learn more cooking techniques and try out some new flavors they may have not had before as well as eager to roll their sleeves up and get dirty! It was a lovely summer night with a lovely host, thanks everyone who came and cooked and tasted and sipped!